I am having a whole lot of net issues right now, and before that I had a few projects to take care of, so the WSC/WPC recaps are temporarily paused. I’ll resume in a few days I think. Anyway, for now, I return to the Daily League on Saturdays. 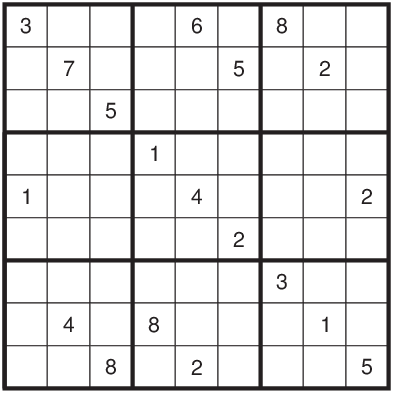 Here is a No Nines Sudoku I had written for Team India’s practice before the WSC. Rules – Place a number from 1-9 in each empty cell in the grid such that each row, column and marked 3×3 box contains each number exactly once. Numbers placed in adjacent cells must not sum to 9.